Who doesn’t like to go on their boat for a fishing trip? Well, if you are one of those adventure enthusiasts then you would like to have a set of proper tools for your journey. One of the pivotal items you should carry is the humble anchor along with a line to ground your boat. In today’s list, we have decided to cover some of the best anchor lines you can buy based on performance and durability. Three strand boat can sustain a force of 6600lbs and is made from tough nylon material. 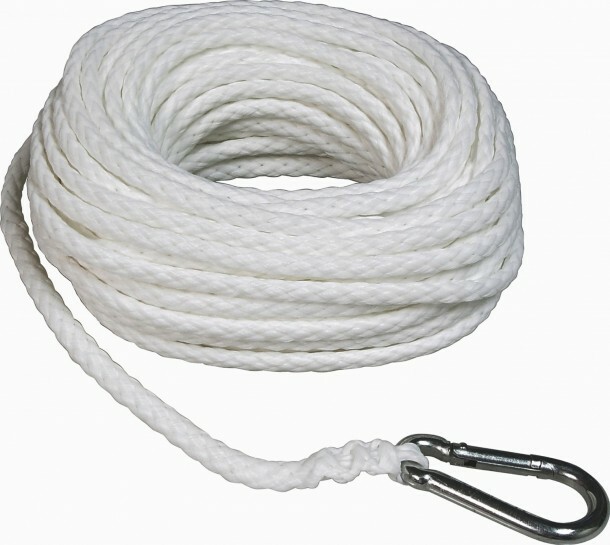 The rope is available in various lengths of 50′, 100′, 150′ & 200′. 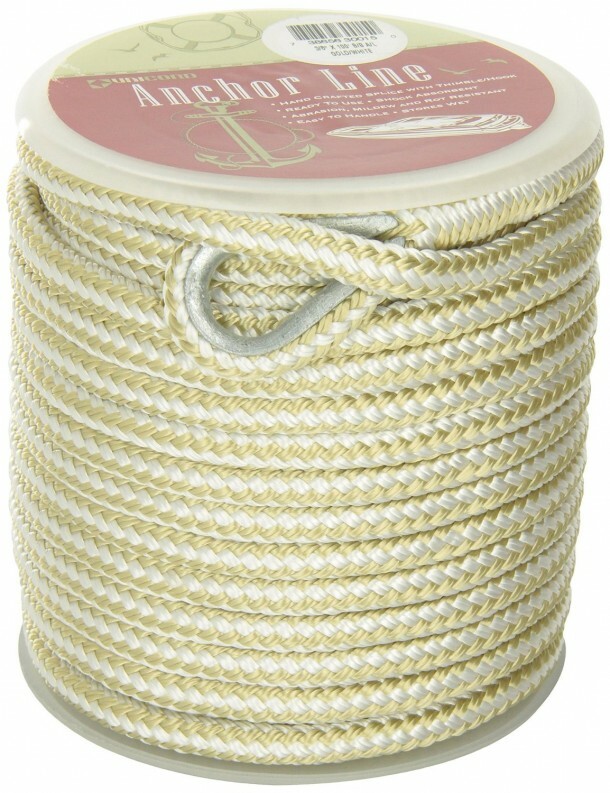 300 Feet anchor line is one of the longest on our list and is rated quite high on amazon.com. The distributor is said to provide speed delivery as well. The Strong and durable line has a unique polyester coating that makes is resistant to sunlight. The nylon line is available is two colors, both black and white. 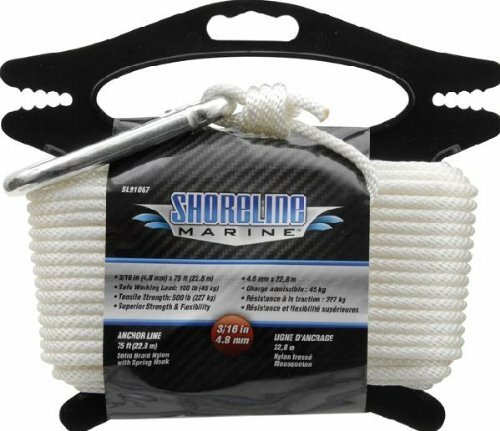 Made from premium multifilament polypropene, the rope has a working limit of 250lb and a breaking strength of 1290lbs. 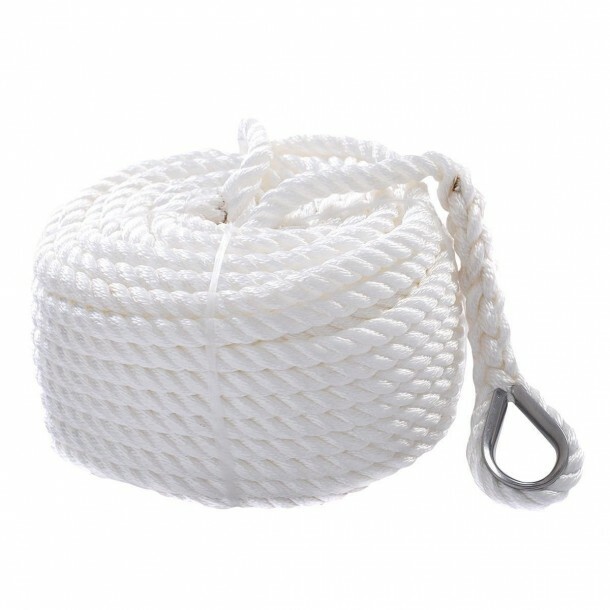 The rope is 150 feet longs and 3/8″ thick and comes with a limited lifetime warranty for the product. 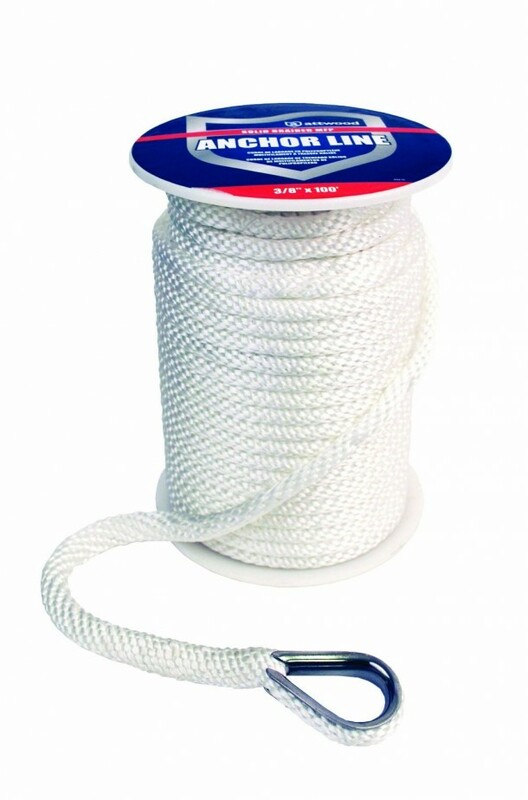 This marine grade nylon anchor rope is advertised to be performance tested by the manufacturer and is almost 3/8 inches thick. 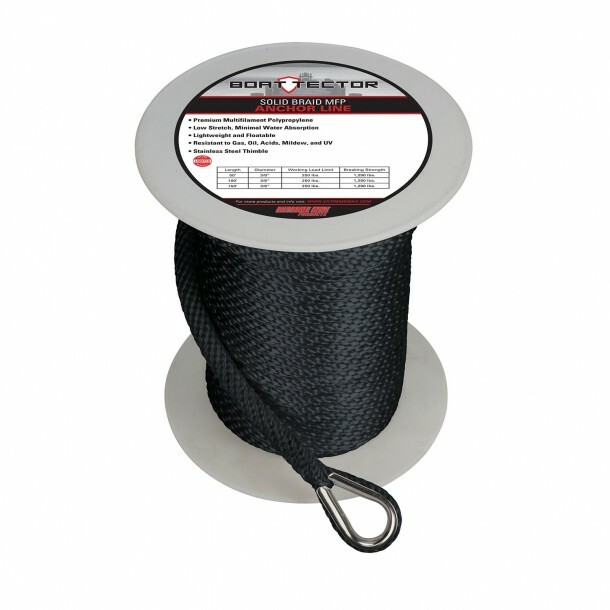 The rope is high resistant to chemical decomposition and is available at a fraction of the cost of others. 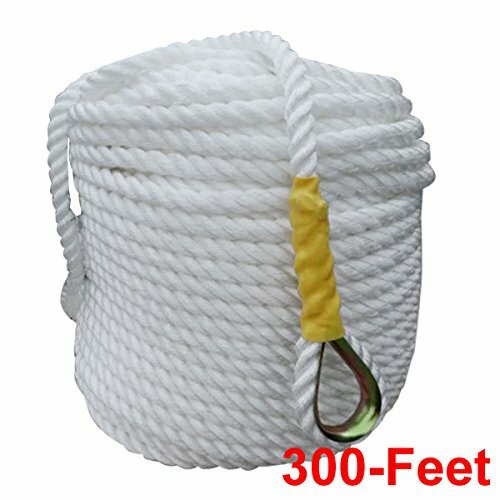 The high-grade product has collected some excellent reviews from customers on Amazon.com where they cite the strength of the rope to be able to handle 3000lb of force. The rope is not double braid but rather a solid braid. The “Shoreline” product is very versatile and can be used with numerous pulley systems as well. Multiple strands of nylon are stitched in a diamond pattern for added strength and is 75 feet long. The most popular yet cost effective anchor line in the market today as it has over a 100 positive customer reviews with a rating of 4.5/5 stars on Amazon.com. 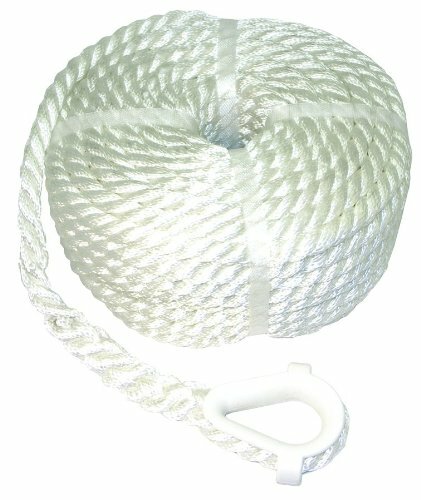 The hollow braid rope is one of the most effective products you can get on the market. UV resistant floatable line stays flexible throughout the course of its life time. 3/8 inch thick and 100 feet long comes with a pre-attached steel hook but be warned as the manufacturer only offers warranty in limited countries. The comparatively expensive anchor line has an especially sliced stainless steel thimble that can staggeringly burden more than 11200lb of weight. 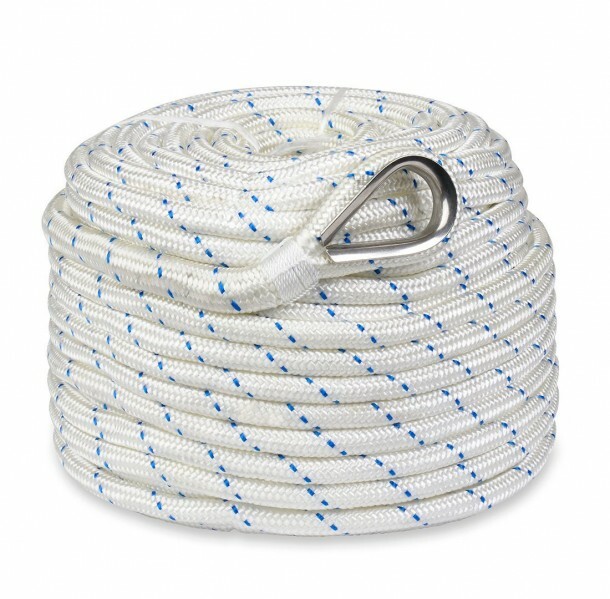 The double braided nylon rope is easy to handle and is available in multiple diameters.